Paten Locke and Willie Evans Jr live at Jacksonville Public Library! 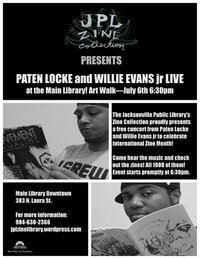 The Jacksonville Public Library Zine Collection presents Paten Locke and Willie Evans Jr live in the Main Library on July 6th! We’re kicking off International Zine Month right with a combination of independent publishing and independent music! Since before Asamov these two talented performers have been setting the standard for artists coming out of Jacksonville. Touring all over America and Europe, these two are some of the most intriguing live acts you will find. From video manipulation, to record scratching, to the art of MCing, to doing all that at the same time! You can’t find anything better than Paten Locke and Willie Evans Jr! My word on that! Plus it’s free! And we’ll have a bunch of brand new zines available for checkout as well! We’ll be in what was formerly Shelby’s Café, right near the Laura Street entrance. The Main Library is at the corner of Laura and Duval, across from Hemming Plaza. Event starts promptly at 6:30p.m. Does middle school even still exist? It seems like a torment from a bygone age, like the Spanish Inquisition. No one with good sense looks back on middle school fondly, and Monica Gallagher captures the deep existential dread that would result from the most trivial matters so expertly in her brief Middle School minicomic. From the pop culture references on the cover (an MC Hammer CD, an industrial-size bottle of hairspray), I’m guessing that Gallagher and I are around the same age, which makes her tale hit close to home personally, but c’mon, adolescent trauma is universal. The story is that Gallagher’s middle school, in an innovation that makes my stomach hurt just reading about it, sent sixth graders to an “outdoor education” camp at the beginning of the school year to… I don’t know, break their spirit fully right off the bat? It is there that this comic begins, a tangle of self-doubt, life-or-death decisions, all-consuming infatuations, and an ironclad social hierarchy. It’s hilarious and cringe-inducing in equal doses. The art is assured and captures the essential awkwardness of everyone involved. And whaddya know? Is that an almost happy ending? Can’t be…. 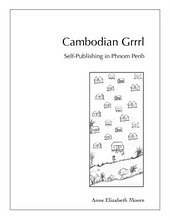 This week, we’ve got not one, but two Zines of the Week and they different than anything else we’ve offered up before. Behold: Hot Rod Zines! 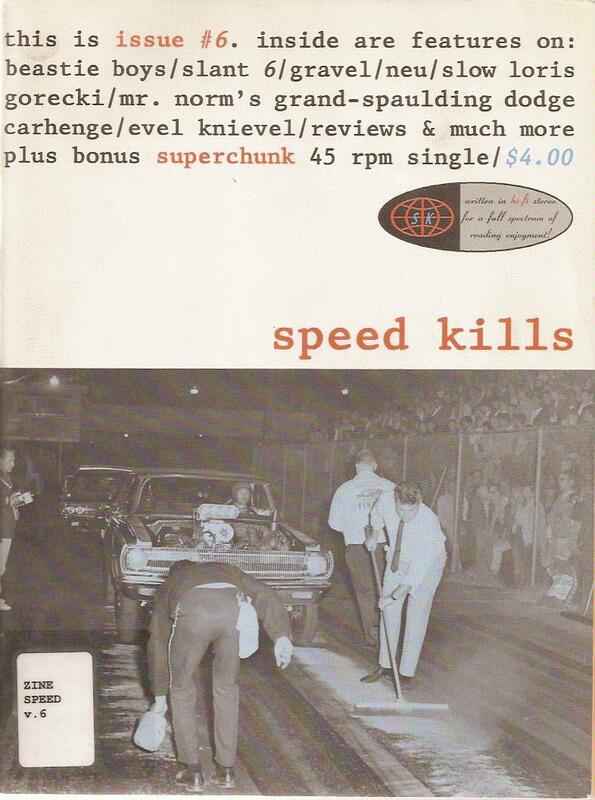 These aren’t your common muscle car mags, these are two mid-nineties gems of muscle-car lovin’ punk-rock culture. You can expect lots of hot rods, rockabilly artwork and attitude. First, Gearhead Vol. 6 puts Southern car culture on display with a terrific article on the roots of figure 8 car racing, a road trip tour for classic car lovers and a visit to Graceland. Also, check out a cool interview with ZZ Top’s Billy Gibbons and lots of zine and album reviews.